ingle Bell Shoppe (owner Dee Corcoran) celebrates ALL the holidays – from the ones you would normally consider to all the others such as birthdays, anniversaries, new births, special events and accomplishments, or just plain having a good day. Looking for a Los Osos Bear? Jingle Bell Shoppe is where you will find a unique teddy bear that provides special memories associated with Los Osos. Stop by for a visit Tuesday through Saturday at 1230-C Los Osos Valley Road! 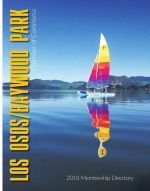 The Los Osos Baywood Park Community Cookbook is now available just in time for the holidays. Spearheaded by Board Members Dawn Rodden and Mimi Kalland, and illustrated by local artist Barbara Schippers, the spiral-bound cookbook includes 150 recipes from more than 65 community members and provides a glimpse into our local kitchens. The cookbook includes recipes for appetizers & beverages, soups & salads, vegetables & side dishes, main dishes, breads & rolls, desserts, cookies & candies, and this & that. Many of the recipes end with personal notes from the contributors about the origin and significance of their recipes. Included also are helpful hints, and a brief local history, particularly as it relates to food. Cookbooks can be purchased for $10 at the LO/BP Chamber Office & Visitor’s Center, Volumes of Pleasure Bookstore, and Los Osos Rexall Pharmacy and Gift Store. All proceeds benefit the Los Osos/Baywood Park Chamber of Commerce.